Bugatti only built and delivered a couple hundred $1.5 million-and-up Veyrons and there's only a handful in California. So when Conan O'Brien trotted out the Bugatti Veyron Mouse on last night's Tonight Show, we wondered: where'd he get it? UPDATED! In case you missed the most recent salvo in the "Late Night Wars," Conan decided to stick it to NBC where it hurts the most — Jeff Zucker's wallet. "For the rest of the week, we're going to introduce new comedy bits that aren't so much funny as they are crazy expensive," he said just before revealing what appeared to be a $1.5 million Bugatti Veyron, dressed up to look like a mouse, with an original recording of "Satisfaction" by the Rolling Stones playing in the background. "Let me ask you a question," he says, standing next to the adorably convincing-looking Bugatti Veyron mouse. "Is this appropriate music for a car that looks like a mouse? No! Does it add anything at all to this comedy bit? No, it doesn't! Is it crazy expensive to play on the air, not to mention the rights to re-air this clip on the Internet?" 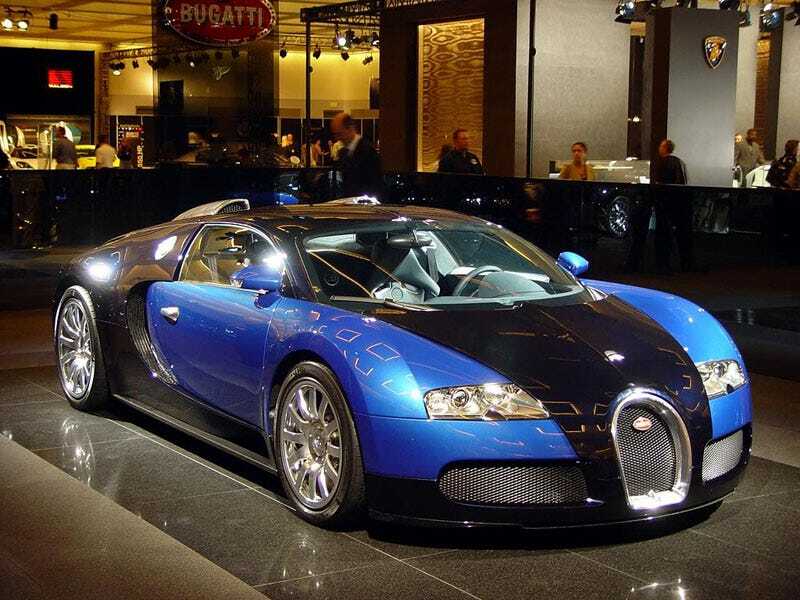 The first possibility is the blue-on-black Bugatti Veyron for sale right now at O'Gara Coach Company of Beverly Hills. As you can see in the photo below it has a similar paint job and wheels, but as much as we can tell from the video the Veyron Mouse has a dark interior whereas the Veyron for sale has a tan one. Because of the lighting we can't be for sure but it doesn't look tan. How many blue-and-black Veyrons are there in Southern California? There's at least one more and it resides at the Petersen Automotive Museum and, according to some, it used to belong to Bob Petersen himself and has the darker interior. But, frankly, we've no idea. Hell, it could have even been a facsimile Veyron. Any reader out there know? Leave us a comment here or send us an e-mail at tips-at-jalopnik-dot-com. UPDATE: NBC, already hemorrhaging money over the late night shuffle and, you know, anything else Jeff Zucker's touched (including Top Gear USA! ), has pulled the Bugatti Veyron sketch from NBC.com and Hulu. Probably because it'd be crazy expensive for them to run it! UPDATE 3: It turns out the second theory was right all along, Conan's Veyron Mouse was loaned to the show by the Petersen Museum as confirmed by them to Jalopnik today.